Erik Jones put his No. 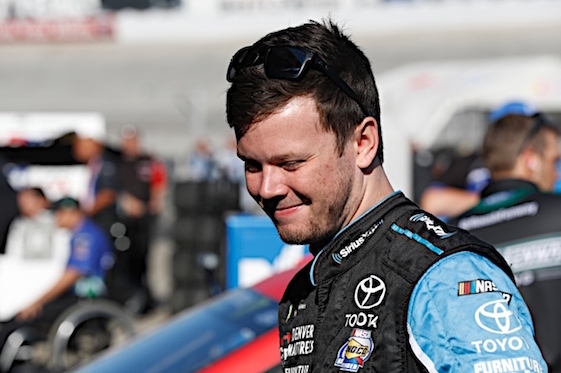 20 Joe Gibbs Racing Toyota on the pole for Sunday’s race at Las Vegas Motor Speedway – the first event of the Monster Energy NASCAR Cup Series playoffs. Jones put down his pole-winning lap in 28.705 seconds (188.121 mph). It was his first pole of the season. His time was .003 seconds faster than Team Penske driver Joey Logano (188.101 mph). (20) Erik Jones (P), Toyota, 188.121 mph. (22) Joey Logano (P), Ford, 188.101 mph. (11) Denny Hamlin (P), Toyota, 187.624 mph. (18) Kyle Busch (P), Toyota, 187.402 mph. (4) Kevin Harvick (P), Ford, 187.396 mph. (12) Ryan Blaney (P), Ford, 187.084 mph. (9) Chase Elliott (P), Chevrolet, 186.735 mph. (41) Kurt Busch (P), Ford, 186.483 mph. (88) Alex Bowman (P), Chevrolet, 186.374 mph. (78) Martin Truex Jr. (P), Toyota, 186.098 mph. (42) Kyle Larson (P), Chevrolet, 185.950 mph. (1) Jamie McMurray, Chevrolet, 183.125 mph. (2) Brad Keselowski (P), Ford, 186.619 mph. (17) Ricky Stenhouse Jr., Ford, 186.599 mph. (14) Clint Bowyer (P), Ford, 186.580 mph. (10) Aric Almirola (P), Ford, 186.548 mph. (48) Jimmie Johnson (P), Chevrolet, 186.509 mph. (3) Austin Dillon (P), Chevrolet, 186.483 mph. (19) Daniel Suarez, Toyota, 186.451 mph. (21) Paul Menard, Ford, 186.432 mph. (24) William Byron #, Chevrolet, 186.400 mph. (31) Ryan Newman, Chevrolet, 185.861 mph. (6) Trevor Bayne, Ford, 185.644 mph. (34) Michael McDowell, Ford, 184.913 mph. (95) Regan Smith, Chevrolet, 185.185 mph. (32) Matt DiBenedetto, Ford, 184.938 mph. (38) David Ragan, Ford, 184.723 mph. (37) Chris Buescher, Chevrolet, 184.660 mph. (47) AJ Allmendinger, Chevrolet, 184.603 mph. (13) Ty Dillon, Chevrolet, 184.231 mph. (43) Bubba Wallace #, Chevrolet, 182.815 mph. (72) Corey LaJoie, Chevrolet, 180.662 mph. (99) Kyle Weatherman, Chevrolet, 180.584 mph. (15) Ross Chastain(i), Chevrolet, 180.337 mph. (96) Jeffrey Earnhardt, Toyota, 179.976 mph. (23) JJ Yeley(i), Toyota, 179.432 mph. (00) Landon Cassill(i), Chevrolet, 178.283 mph. (51) BJ McLeod(i), Ford, 177.538 mph. (66) Timmy Hill(i), Toyota, 176.085 mph. (7) Reed Sorenson, Chevrolet, 0.000 mph.